Conrad Williams channels early Clive Barker in a nightmarish depiction of London’s last days. It’s not a sudden apocalypse, but a slow, barely perceptible corruption of the society, somewhat similar to the zombie invasion in Shaun of the Dead. One moment there are reports of graverobberies, then people get eaten on the street. The folks responsible for the calamity are the Unblemished of the title; an ancient race of humanoid creatures with perfect skin, perfect teeth and a somewhat ghoulish appetite. The story follows several characters in turn: a photographer who’s increasingly tainted by a connection with the creatures, a mother whose daughter came into contact with the nasties in the prologue, and a pair of serial killers. While the first two are well-developed characters whose fate can be cared about, the latter two are sketched more broadly and seem sadly more and more irrelevant as the story progresses. On the other hand, a group of the creatures who try to emulate human behaviour (taking names such as Graham Greene, Stanley Kubrick and Kurt Cobain) are a nice addition and one almost hopes they had been granted more time in the limelight. The story is slightly uneven, with a plodding first third. It picks up after that for a very entertaining and fast-paced middle section, only to reach a quick and somewhat unsatisfying conclusion. However, the strength of the novel lies not in the plot, but in the ideas and the language used to describe them. Reminiscent of Barker’s stories from the 80s, the imagery is gorgeous in its bloody, visceral decadence. Body parts are sawn off with antique saws, teeth are pulled and reinserted, syringes are eaten as a snack. This all results in a thoroughly dark and twisted atmosphere that permeates the novel and seems to worm its way into even the most innocent scenes. The menace is unrelenting, the world is constantly in danger of succumbing to forces that are brutally violent. It’s a nightmare, but it’s a fully realised, wonderfully detailed nightmare. 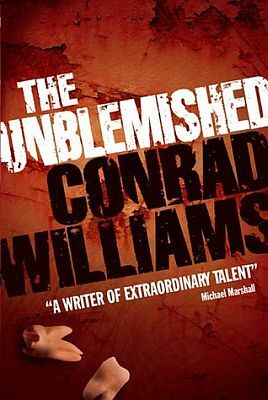 In general The Unblemished is a brilliant throwback of a novel that doesn’t quite warrant a label as a masterpiece, but isn’t that far off either. The good for the most part outweigh the uneven. Certainly worth a look for fans of Barker’s Books of Blood or similar works from that period.